I finally got to see the 40th anniversary re-release of Close Encounters of the Third Kind last night, and it was worth the wait. Because it was a Thursday night, and the last night of CE3K's one-week release, my wife and I had the theater pretty much to ourselves, which was kind of nice. It hasn't been that long since I've watched the blu-ray at home, so the movie didn't exactly feel fresh to me, but I enjoyed the hell out of it just the same (After 40 years of looking, I finally spotted R2D2 on the alien mothership, so that was a big deal). Still... there are still some details of the movie that rankle; a lot has been said about how wrong it is for the Roy Neary character to fly off in an alien spaceship and leave his wife and kids behind, but what about the Gillian Guiler character letting her little boy Barry run off all over the damn place? And when she finally catches up with him, she decides to give him a talking to in the middle of a highway, on a blind corner no less! And my #1 pet peeve: why does the mothership change size and shape in virtually every shot? Someday I'll have to ask Doug Trumbull about that. But that's not what I want to write about. I want to say a few words about the most intriguing and underdeveloped character in the movie: Larry. You remember Larry: he is the only person who takes off his gas mask and escapes the Army helicopter with Roy and Gillian just before being flown away from Devil's Tower. The people in the helicopter are, of course, the random men and women who have had the image of the Tower planted in their subconscious minds by the aliens, and have journeyed to Wyoming to find out what it all means. I always thought it was pretty cool that Larry jumped off the chopper in an act of defiance against the military, even if his attire bothered the hell out of me. Who goes on an ill-advised gonzo travel adventure to the middle of nowhere, Wyoming, dressed like he's going out on a first date? Really, Larry? You got up this morning and said, "Today I'm going to infiltrate a high-security area, climb a 867-foot rock precipice and make contact with aliens from space. I think I'll put on my best polyester slacks and dress boots, a turtleneck, and my favorite striped cowl-neck sweater. Oh, and I'll bring along my leather jacket, too." That's just weird. Still. I love Larry. He's got guts. He's got vision. And he's not afraid to get those dress boots scuffed up climbing the basalt spires of Devil's Tower. What's more, even as he is racing up a mountain while evading helicopters and soldiers, Larry doesn't just toss his cumbersome leather jacket aside as many of us would have done. He just keeps it draped it over his arm, to keep for later. What a guy! What drives a man like Larry? What demons are screaming inside him? What lusts and desires make his heart pound? I just imagine Steven Spielberg staying up night after night, puzzling out the mystery of Larry and what he represents, going through draft after draft of the screenplay, never quite capturing the essence of Larry but obsessed with achieving perfection in the character. And we must admire Spielberg's courageous decision to then let Larry drop his guard as the Army helicopters start spraying tranquilizer gas in a last-ditch attempt to stop him, Roy and Gillian from reaching the secret UFO base on the far side of the Tower. There is so much going on in the moment at which Larry says, "They're just cropdusting!" No, Larry, it is NOT ok to be sprayed with pesticide, and even if it was, what kind of crops does he think are growing on the side of a mountain? What is Spielberg trying to tell us?? Of course, we all know how it ends for Larry. After everything he's gone through to be present at the most amazing moment in human history, Larry succumbs to the tranquilizer gas just a few steps away from the secret UFO landing base. 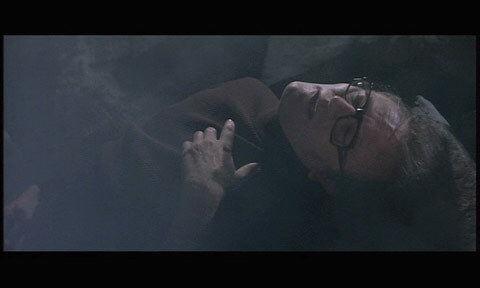 Instead of taking part in one of the greatest final acts in motion picture history, Larry leans back on a rock and falls into a deep, dreamless, drug-induced sleep just short of achieving his dream. No "wishing on a star" for sweater man. It's like all of a sudden he doesn't care. I don't get it. He had everything going for him, and then he just gave up and gave in, clutching his leather jacket as he faded from consciousness. And that's the last we see of Larry. The rest of the movie, to be frank, feels a little flat. Huh? Sure I have. I've camped at Belle Fourche River twice in my life. Perhaps Larry's alien-implanted subconscious vision was obscured and weakened by all the other impulses in an addled mind. Whatever the meaning (if any) I was always irritated by Larry's turn to frivolity within yards of the trio's destination. Maybe his inappropriate wardrobe was meant to increase our annoyance. So Larry either represents our best, or our worst... This is deep. On the other hand...three's a crowd. You notice all the aliens are buck naked. Larry's LA wardrobe might've had an opposite effect & scared the b'jesus out of them.